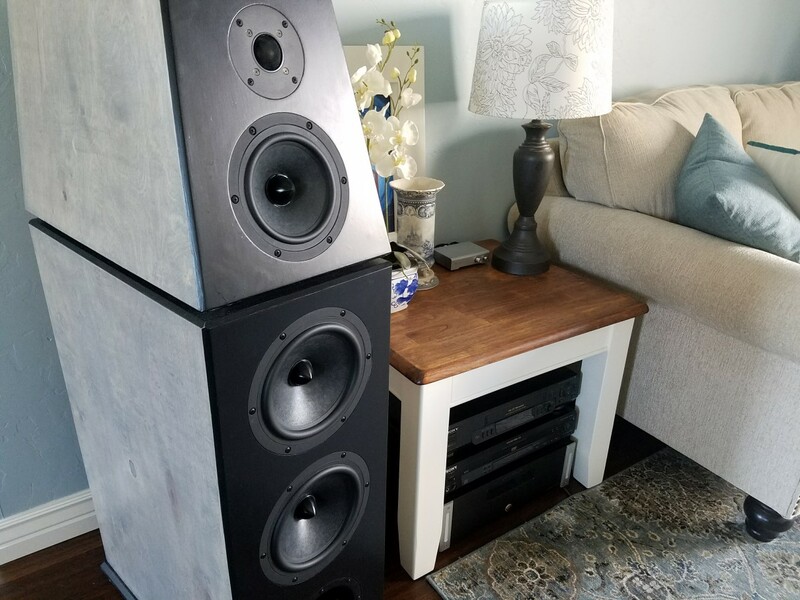 ← DM-4 Reference Speaker Build Part V – Finally Complete! It’s been about a month since the completion of these speakers and it’s about time I do a write-up on how I set up and tuned these speakers. I’ve spent the last several weeks and many hours setting up and dialing in these speakers and overall I’d say I am very happy with the results of this setup. I doubt this will be my final tuning/crossover setup with the MiniDSP but for now I’m just enjoying the new speakers and how awesome they truly do sound. Because overall the speakers sound fantastic. Better than I could have hoped for. Of course, my opinion is somewhat/mostly biased. But they literally sound just how the response plots would indicate – flat and neutral. No frequency range sounds out of balance, neither too forward nor too timid. But before I get into the subjectivity that is describing hi-fi sound, let me share the setup. 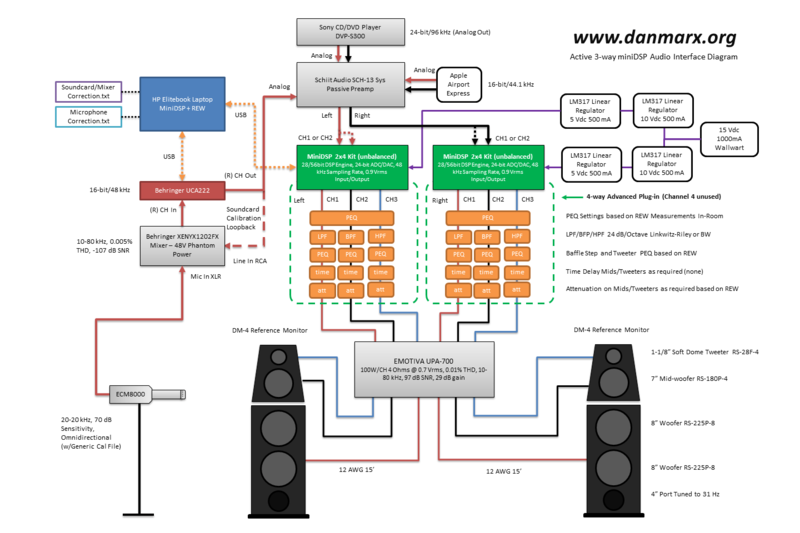 The above block diagram details the setup for measuring and tuning the speakers. The setup starts with a pair of laptops, one running windows 7 with the MiniDSP 4-Way Advanced Crossover Plug-in while the other is running Lunix Mint Cinnamon and REW 5.19 Beta 4. The sound card is a Behringer UCA222 connected via USB. 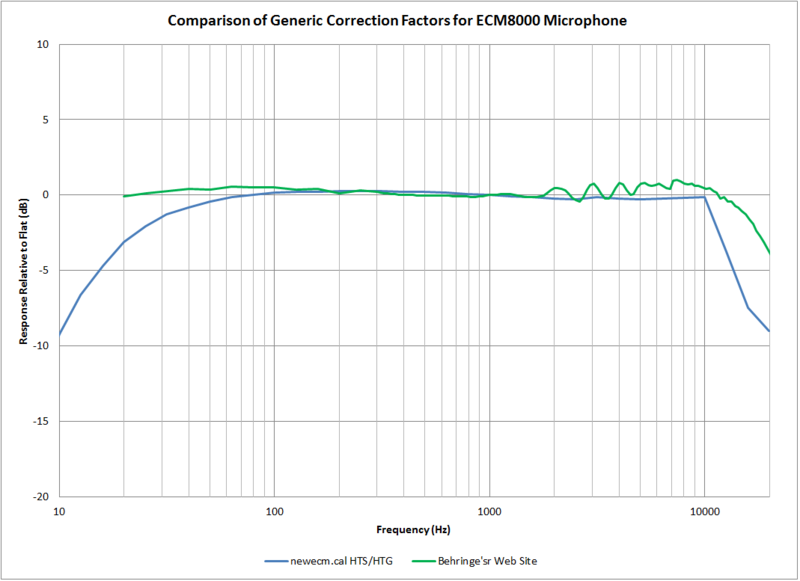 My measurement mic is a Behringer ECM8000 using the cal factors available from Behringer’s website. Home Theater Shack also has a popular cal table for the ECM8000 (newecm.cal) but I felt like it over-corrected above 10 kHz and wasn’t realistic of the actual response of my microphone. When I use it, it causes almost every speaker I own to have this rising tail at 20 kHz that I just don’t believe. Behringer’s correction factor is more subtle and even though I am sure it still does not perfectly represent my microphone, I feel like it’s close enough for casual home use. See my comparison plot below. Also the Behringer cal table includes phase. I think the main reason people use the newecm.cal is because the correction factor goes all the way down to 5 Hz to satisfy all the bassheads need for insanely low frequency measurements. Since the mic needs 48V phantom power, I use a Behringer XENYX 1202FX mixing console (which is normally part of my home recording studio) between the mic and the UCA222. A Schiit Audio SCH-13 Sys Preamp allows simple volume adjustment of two different sources. For my modest setup at the moment, I have an old Sony DVD/CD player and an Apple Airport Express. Better sources are in the works, including a real pre-amp, but for now, this is what I’ve got. The Airport Express is more for just convenience of listening than any kind of critical listening. Check out this post here on my whole house audio system. So I debated doing a really nice all-aluminum housing for the MiniDPs and in the end just installed everything into an old VCR enclosure. The big spring-loaded slot in the front makes for easy access to the USB cables that I keep tucked away in there when not in programming mode. It’s not super glamorous, but is functional and practical. Both MiniDPSs are mounted on standoffs along with four LM317 linear regulator kits I picked up for $2 a piece on Amazon. I had an old 15 Vdc wallwart that after tearing it apart realized it was complete garbage. It claims an output current of 1000 mA which is just about right for two MiniDSPs (they draw 150 mA each) while maintaining some overhead. But with only a single transformer, a full-wave bridge rectifier and one capacitor, this would not be my first choice in powering any audio gear. But it’s nothing we can’t clean up nicely with some decent linear regulators. The wallwart provides 15 Vdc and feeds the first LM317 which takes the voltage down to 10 Vdc. The second LM317 takes the voltage down to 5 Vdc and over to the MiniDSP. Each LM317 claims roughly 65 dB ripple rejection so long as Vin-Vout > 5 Vdc at 150 mA. So with two in series, we probably get around 100 dB rejection which should be enough for even the most demanding audio needs. Since the MiniDSP outputs feed the UPA-700 amp with a fixed 29 dB of gain, everything in the signal path and DC bias paths needs to be dead quiet in order to provide quiet, hum-free and hiss-free experience. I think I succeeded because even though there exists what I would call traditional background white noise in the setup, you only hear it from less than 1 foot away from the tweeter with your ear directly in front of the speakers. Once you back up a couple of feet, everything is dead quite. And this is with the original MiniDSP kit which only claim >98 dB SNR. It’s definitely plenty for me. And yes, the MiniDSP’s are on all the time. For curiosity sake, I plugged my little VCR/MiniDSP setup into a Killawatt meter and measured a measly 3 watts (or 0.003 kW/h) which if left on year-round amounts to only 26 kW/year (24*365*.003). I pay about $0.1/kWh at my house on average which amounts to a grand total of $2.60/year. So to leave on a pair of MiniDSP’s 24-7-365 costs less than a side of fries at Five Guys. In other words, it’s basically peanuts. Which oddly enough, you can also get at Five Guys. 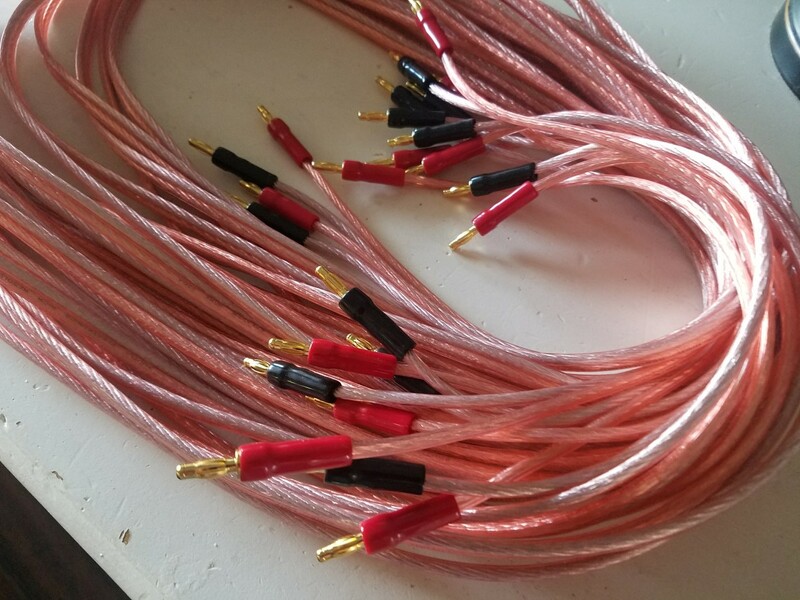 I made six sets of speaker cables that are each 14 feet in length from a 100-foot spool of 12 gauge OFC speaker wire from Parts Express. I bought 12 sets of black/red screw-style banana plugs which dressed up the cables nicely and provide a clean transition from speaker cable to the binding posts at the back of the speakers. I wanted to do something fancier on each side, like bundle each set of cables into some nice black expanded cable sleeving but just ended up leaving the speaker cables exposed for now. It’s functional and does the job. No complaints here. 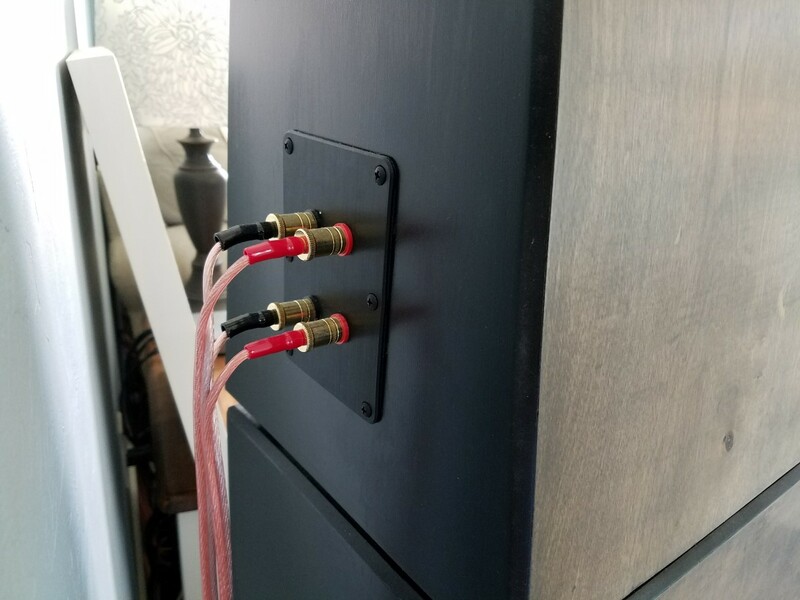 Here’s a quick shot of the back of the upper cabinet with the nice Dayton Audio Premium gold-plated binding post terminals and aluminum face plate from Parts Express. 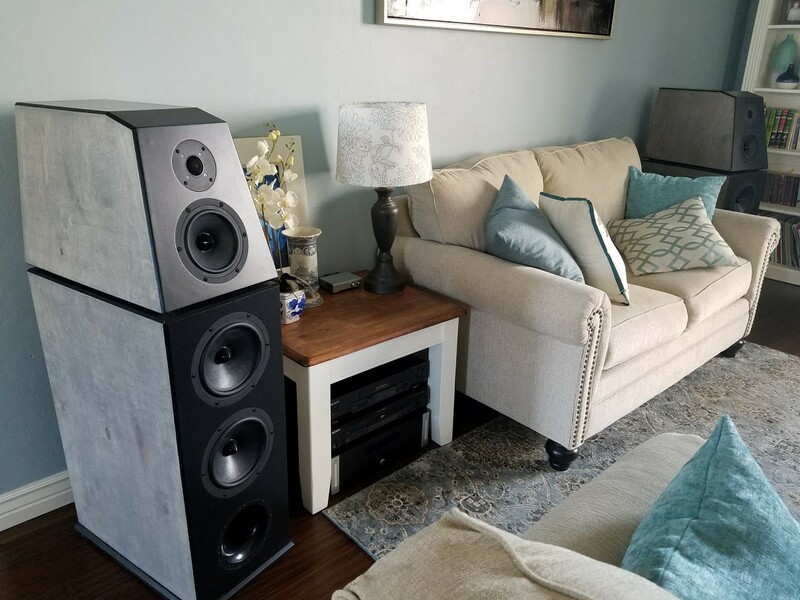 Normally I wouldn’t go all out and buy such fancy binding posts, but for this build I decided they would complement the high-end feel of the speakers overall. They are super nice and provide a robust quality and feel to the speakers. I definitely recommend them for that great premium look. Here’s the basic microphone setup for doing near-field measurements of just the midrange driver. I moved the microphone around a lot during my measurements. I did near-field plots of each driver at 0.5″ distances and then 6″ and 12″ and 30″ and 1M distances (approximately) as well as in-room measurements. I haven’t done a lot of off-axis measurements yet. But I do plan to take more measurements as time permits. This mic orientation and distance do not represent all of the measurements taken/shown here. So this is sort of how the setup looked. The old Dell Inspiron was used to connect to each MiniDSP and provide instantaneous crossover and PEQ changes while the HP Elitebook on the right was running REW for taking and recording all the measurements. I only played with one speaker at a time, so I could make all the adjustments to just one MiniDSP unit. Once I was satisfied with the settings, I saved a configuration file and then loaded the settings onto the second MiniDSP. I did some casual listening of various types of music with each setting. Then I would go back to making adjustments as needed and redo the process of tweaking one unit, taking a measurement, loading the second MiniDSP and then doing some listening. I basically did this for about a month. What I’ve really been doing with this whole experience is educating myself on not only the basics of crossover design but some of the more complex elements as well. I figured I have a really nice set of speakers built into a great enclosure, now is my opportunity to really understand the benefits of different slope rates or crossover types on a really nice set of speakers. I have at my disposal the ability to test multiple filter types and slopes and take tons of measurements to see just what makes one filter better than another. So the measurement and tweaking process is definitely on-going. One of the banes of active crossovers I suppose. The constant fear that just another tweak will make it sound so much better, or 10 times worse. I had started with a Linkwitz-Riley, 24dB/octave, 200 and 2,000 Hz crossover with almost no PEQ and 3 dB padding on the mid and tweeter with a 0.08 ms time delay on the tweeter. The slope rate and frequency was mostly just pulled out of the air, though loosely based on tweeter Fs and cone break-up modes of the RS-180P-4. I think this woofer works admirably up at 2,000 Hz. My near-field measurements matched very closely with PE’s measurements showing 1st, 2nd and 3rd cone break-up modes at 4 kHz, 5.3 kHz and 6.4 kHz and then rolling off sharply after that. I picked 200 Hz for the mid because it is simply 1/10th the tweeter crossover frequency. That’s really the only reason. The overdamped sealed enclosure actually starts to rolloff at around 100 Hz naturally (according to my measurements) so 200 Hz is basically double that. Mainly, I didn’t want the speakers to be a 2.1 way where the lower cabinet is just a subwoofer producing only bass. It seems like anything between 200 and 400 Hz would be appropriate for this setup though I have no real reason to limit the upper frequency response other than perhaps to match the natural frequency where baffle step losses occur. From my measurements baffle step losses look to occur between 400 and 200 Hz and is about -5 dB. As far as tweeter minimum crossover point, I remember from times gone past the rule of thumb being 2x the fs of the tweeter minimum with a 12 dB octave slope. Though this may work in general, distortion levels will rise as the tweeter crossover frequency approaches fs and power handling will decrease. So from that perspective, it’s better to maintain a minimum crossover of 3x the fs and 18 dB / octave slopes or higher, but only as a rule of thumb. I still would like to experiment with the RS28F-4 down at around 1,200 Hz with 24 dB/octave slopes and see what it sounds like. 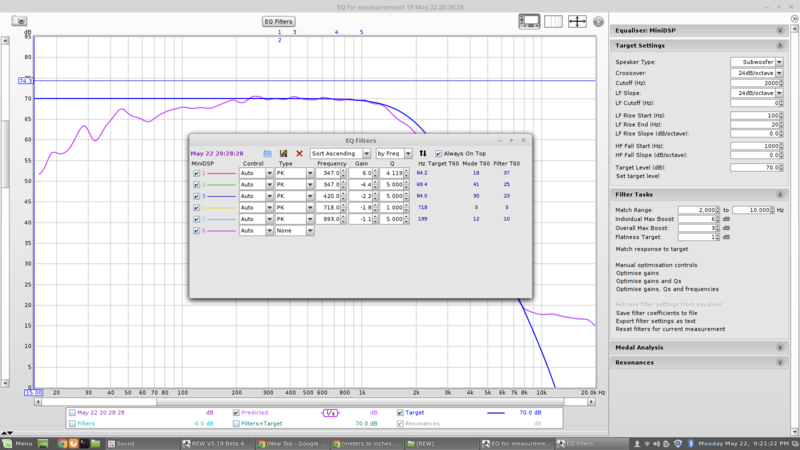 So far the lowest I’ve run is 1,700 Hz, which is where it is at right now with 24 dB/octave Butterworth slopes. Besides setting the overall level of the three drivers (in amplitude), I feel like the crossover frequency has the largest overall impact in providing the desired tonal quality of the speaker. So while it may seem like an arbitrary selection point, it can make or break your speaker system. But how do you exactly determine the best crossover point? For me it’s about trial an error. Try something out, give it a listen for few days/weeks and then try something else. Ultimately whatever crossover point sounds best is invariable the best point. Though it’s doubtful that any single point or crossover type, or slope is “the best”, there must be dozens if not hundreds of viable options. I know many textbooks tend to favor crossover points that will sum acoustically with the natural roll-off of a driver. Thus allowing an acoustical slope that is steeper than the electrical slope of the crossover alone. These crossover points have to be very specific to coincide with the natural roll-off of the driver so as to sum appropriately and provide the desired response. But does this actually sound better than simply picking any other appropriate frequency regardless of the driver’s natural roll-off? I look at it somewhat theoretically and ask myself, which driver do I feel has the best opportunity to reproduce a given frequency range the most accurately? In the broader sense this is probably obvious from looking at the natural (without crossover) frequency response plots and distortion plots of each driver. 1″ tweeters do a horrible job reproducing bass/mid frequencies and woofers can’t produce treble/highs worth a darn. Obviously, but what is more subtle to me is the overlap frequencies of the different speakers. Take the case in these 3-way speakers where the 100-500 Hz region could easily either be covered by the dual 8″ woofers or the 7″ midrange. As is the case with the 1,200-2,400 Hz frequency region, could either be played by the 7″ woofer or the tweeter. Yet different crossover points even within these small frequency regions will certainly cause significant tonal balance and sound quality to change. Something a simple on-axis frequency response plot or phase response plot probably wouldn’t even capture. However distortion plots may reveal a little more into which drivers can produce which overlapping frequency range better, in addition to off-axis response plots. I bet the the 1-1/8″ dome tweeter produces 2,500 Hz tones “better” than the 7″ woofer when you consider phase, on and off-axis frequency responses, impulse response and distortion. Good crossovers are about the creating predictable polar response patterns as a result of multiple drivers at different Y and Z axes and have them sum appropriately. If I had enough time I could compare such measurements of each driver in the ranges where they have natural overlapping usable ranges and pick which one does it best. At some point the crossover point that is selected should be based upon the crossover of where the woofer begins to sound better than the tweeter and vice versa. Here’s a quick shot of my little Schiit Sys passive pre-amp. I bought this mainly as a stop-gap until I made a decision on what active pre-amp I really wanted to purchase long-term. As a passive little unit, it works quite nicely, it basically provides a completely neutral response to any fixed-output analog signal and allows attenuation of that signal with reasonable resolution. 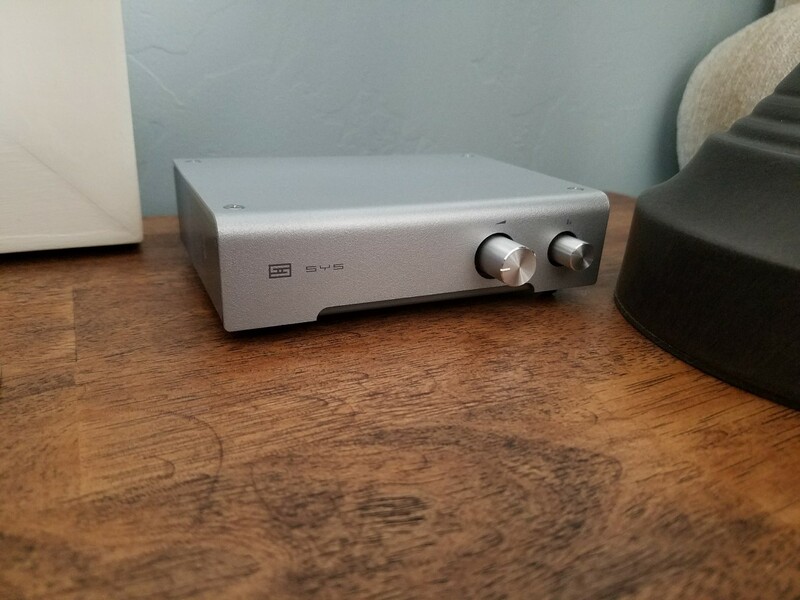 Once I received the unit, I ran the Schiit Sys through REW because, well, why not! I was really curious about overall flatness, roll-off and left-right amplitude balance. I wanted to see just want this thing actually looked like electrically. I uploaded some of the plots here. Basically to sum up the plots, at full volume (the 5 o’clock position) the SYS is about 0.4 dB down and nearly perfectly flat from 20-20,000 Hz with only a subtle low-frequency roll-off of about -0.05 dB at 20 Hz. 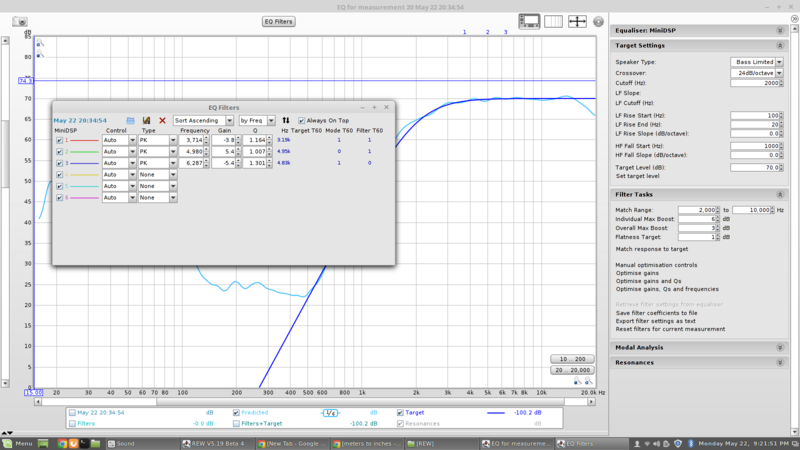 Left-right balance is also excellent differing less than 0.05 dB between the two channels. I then took ten additional measurements with the dial at the 4 o’clock, 3 o’clock, 2 o’clock, etc. locations and continued to watch for frequency flatness and channel imbalance. The left-right balance began to diverge once the dial was moved off of the 5 o’clock position (full volume). At its worst the balance is separated by only 0.6 dB left to right while the flatness remains about -0.2 dB down at 20,000 Hz. I ran into noise floor limitations at low frequencies in my setup once I exceeded about 30 dB attenuation or the 10 o’clock position. Notice in the plots I had to zoom way in to even see anything substantial. At first glance the plots look like the loop-back reference measurement. At minimum volume the attenuation is basically infinite, equal to disconnecting the cable, but the limitation of my setup was around 70 dB (above 1,000 Hz and only 30 dB below it). Overall the volume adjustment feels natural and increases appropriately based on dial location. The flatness performance is quite exceptional, at its worst being only -0.2 dB down though the L-R imbalance was less than perfect, it’s likely mostly inaudible. This kind of performance is quite good actually considering the simple use of just a wiper-style potentiometer. Also, the switch which selects between inputs causes no click or pop in the output, even with the output driving a fixed-gain amp straight to the speakers. So I am happy with this unit and feel it was a worthwhile addition to my little setup and can recommend it easily. It’s got a solid feel to it, construction is nice, and it’s really small, so it fits just about anywhere. 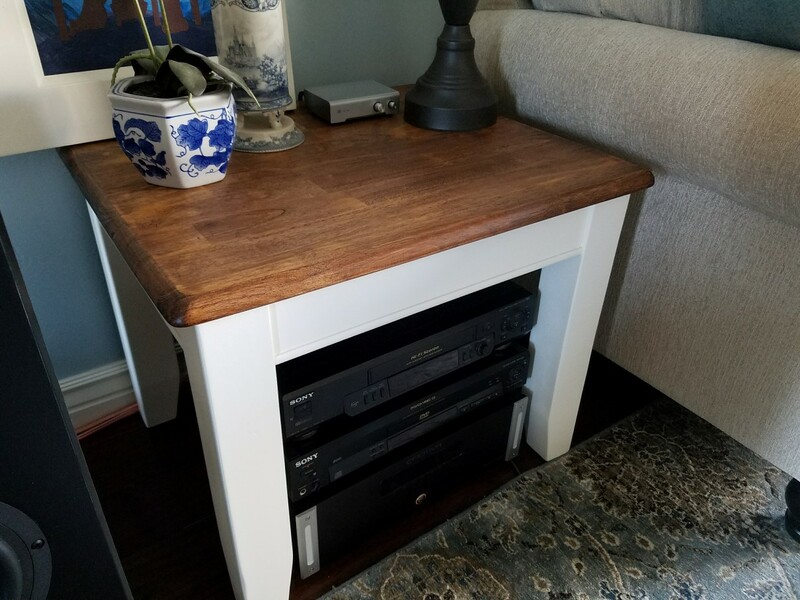 So I have no real stereo rack, everything just sits on the floor underneath an end table next to the couch. This is my best chance at having this system pass the WAF. Another shot of the setup. An Airport Express ($25 on Craigslist) and a Sony DVP-S300 DVD/CD player (a $6 steal from Goodwill), the Schiit Sys, two MiniDSP 2×4’s in a VCR and an Emotiva UPA-700 amplifier. Quite compact and mostly unobtrusive. And here’s a shot of the whole room. The speakers are close to the walls but it’s the only practical location for this room. I’ll start off with a final response plot of the three drivers with the crossover settings at 170 Hz and 1700 Hz, they are Butterworth filters at 24 dB/octave on all drivers. The response is smoothed with 1/24th octave smoothing. Measurements are taken in-room at approximately 20″ from the top of the midrange driver. There is some active PEQ on just the two 8″ drivers and some subtle PEQ settings for the entire speaker. Overall, the speaker itself really needs no PEQ. Most of the EQ I added was just to compensate for room modes, not necessarily driver response imperfections. I grabbed a couple of screen shots of the REW auto-tuning mode. These pics don’t represent the final settings, but show you how it’s possible to create a target response from measured data and what PEQ settings in the MiniDSP are required to achieve it. 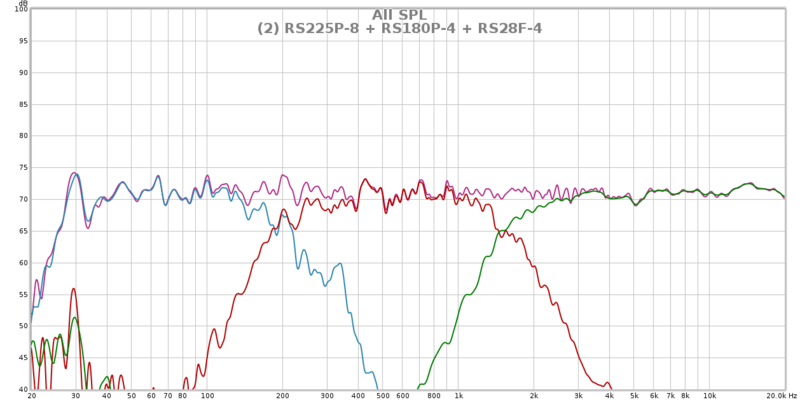 I balanced the output of the drivers by adding 4 dB of attenuation to both the mid and tweeter equally. This roughly accounts for most of the baffle step losses and provides the overall flat on-axis frequency response you see here. 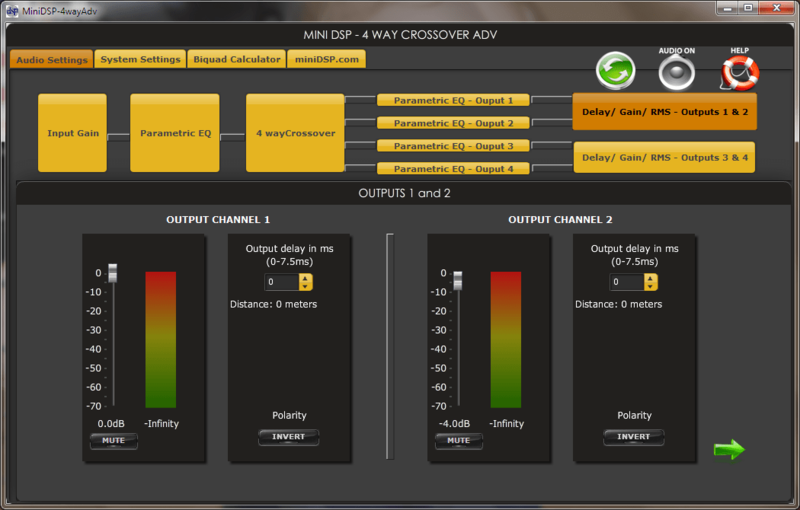 The above plots show multiple overlays of various different settings used while dialing in the PEQ, levels and crossover settings. The measurements are also done at varying distances. For any given tuning session I would quickly fill all 30 measurement locations in REW with multiple measurements from multiple settings. Either changing the slope type, rate or other settings. Even this graph only shows a handful of settings. Most of the time I don’t even write down what the settings are for a particular measurement. Again, I’m just trying to see what settings affect what and how it changes the what can be measured in REW. I used the target filter response option in REW to auto-generate PEQ settings and then just typed them into the MiniDSP. It does a remarkable job of predicting the new response each time. I was quite impressed. This graph shows the basic final on-axis frequency response plot of the entire speaker with 1/24th octave smoothing and includes the phase response. Frequency response is roughly 30-20,000 Hz ±2 dB. I unwrapped the phase for a better visual depiction of what the phase response actually looks like. 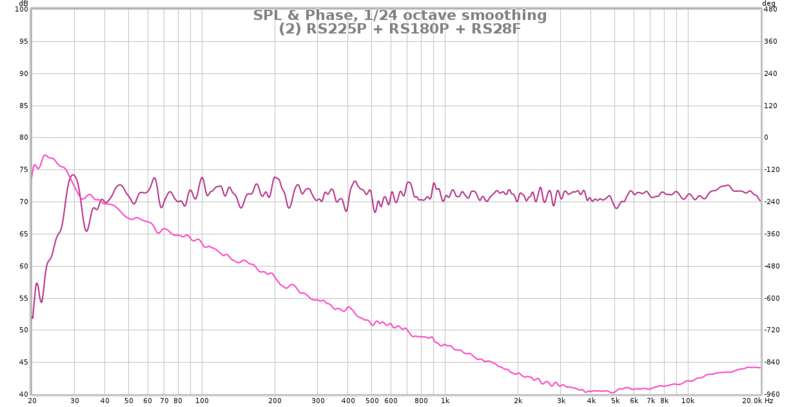 Phase is nice and linear (though not flat) and changing at a rate of about 120°/octave from 20-2,000 Hz. Then from 2,000 – 20,000 Hz the phase begins to reverse slightly and flattens out somewhat changing no more than 100° over this entire range. 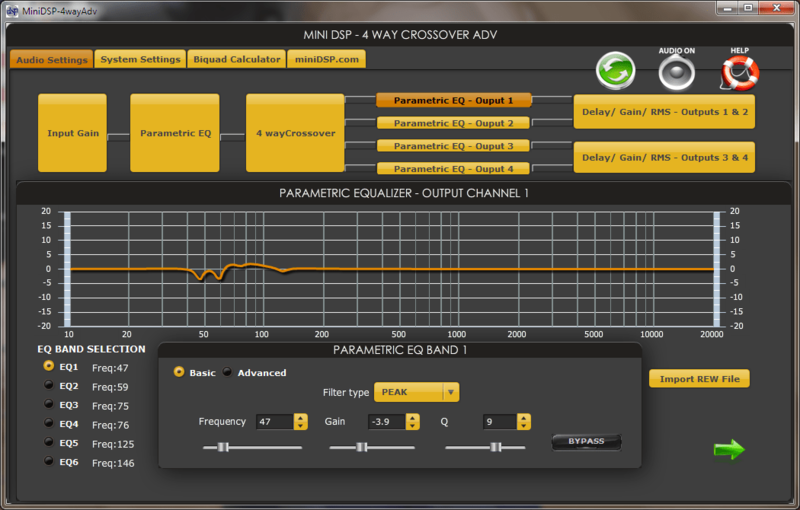 The tweeter alone pretty much produces this kind of phase response no matter what EQ/crossover settings I used. The tweeter phase is not inverted from the woofers and there is no electrical time alignment on any of the drivers. Since most people don’t talk about what phase actually sounds like, I don’t really have a good feel for whether or not this kind of phase response is good or bad or just otherwise unremarkable. I’m going to start playing around with the timing and crossover slopes to see if I can shift this phase response around and see what that sounds like. 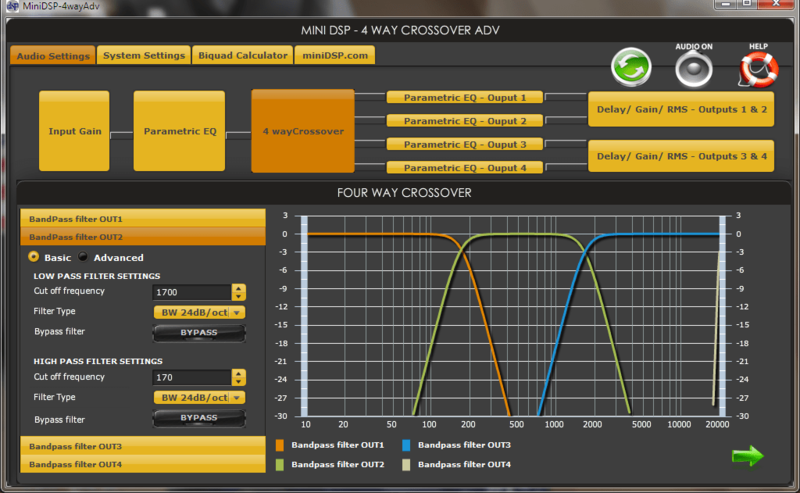 Lastly, here’s a few screenshots of the 4-way Advanced Crossover Application from MiniDSP. Here are some of the windows available for setting up the MiniDSP, such as the crossover freq, slope rate and type, the PEQ for the woofers and the output level settings for the woofer and midrange which shows the -4 dB for the mids. The tweeter is also -4 dB with no time delay on any of the drivers. Nothing too fancy otherwise. The interface is functional and intuitive and changes are made instantaneously. So that’s basically it. Not much more I can say about these things. Though there is one other thing I can share that I did that I thought was kind of fun and hadn’t seen anyone do. I put the mic in the exact location that I took most of these measurements and then recorded an entire song through the mic at a reasonable volume and imported the recorded song into a track in Audacity along side the original .wav file. Then I bounced back and forth between the recording and the actual song with a pair of headphones and I was honestly quite amazed at how similar they were. Aside from the recording sounding more “live”, everything else was spot on, the bass, treble, midrange, vocals, they all sounded fantastic and balanced nicely with the original source. If my room had more acoustic treatment on the walls and floor, I bet I could have narrowed the gap even more between the recording I made and the original, since that was really the only defining different between the two recordings. That and the fact that I converted the song to mono since I was only capturing a single speaker with the mic. But you be the judge, click play on the audio clip in the media player below to listen to a song recorded with a mic in front of the speakers against the original source CD. The first 15 seconds is the original CD while the the next 15 seconds is a recording of speakers and so forth. The audio alternates every 15 seconds between the source music and the speakers until the song ends. The song is I Only Have Eyes for You by Harry Connick Jr. It’s an okay song for speaker auditioning, though arguably I could have picked something more jazzy and upbeat, it’s got some good vocals, a decent bass track, some piano and strings that can help showcase a speaker’s overall range. Put some headphones or use some good computer speakers and have a listen. See if you can spot the transitions without watching the time. Enjoy! 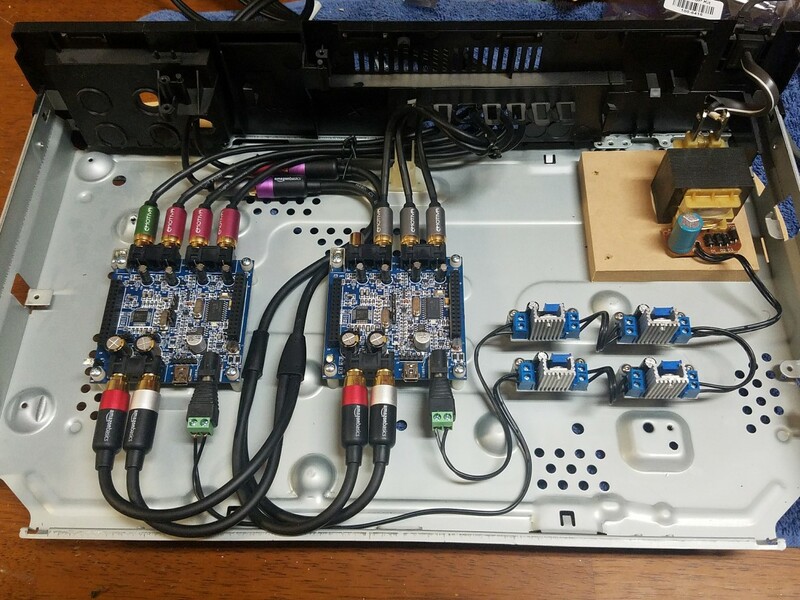 This entry was posted in Audio/Video and tagged 2x4, audio, behringer, butterworth, calibration, crossover, dayton audio, DIY, ecm8000, frequecy, hi-fi, lm317, measure, microphone, minidsp, Music, paper cone, reference, REW, rs-28f, series, sound, speakers, sys, tuning. Bookmark the permalink. Good inf Dan, I am working on a similar setup, but with the Statement ii speaker build. What is the point of the nearfield measurements? 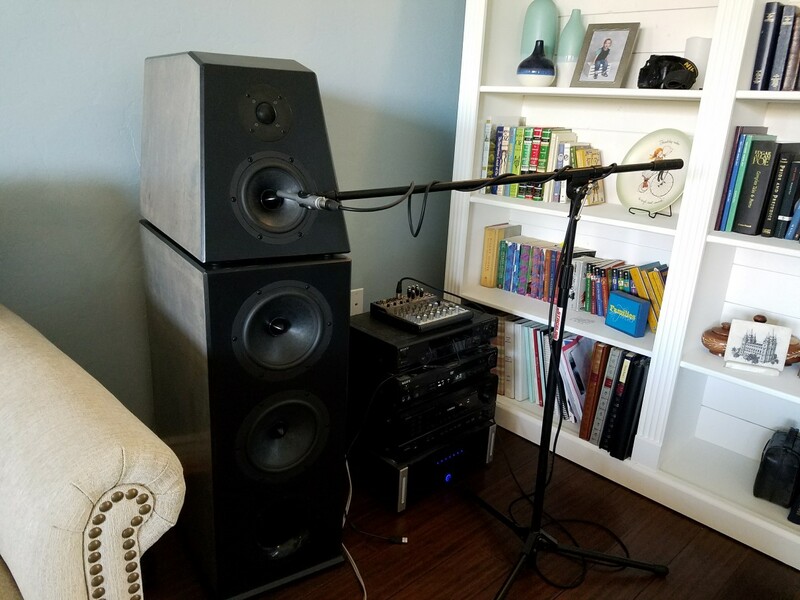 I mean, the end goal is how well it sounds in the room, right? So I’m currious what the idea of such close measurements of each speak is. Of course, ultimately how a speaker sounds in the room is what matters in the end. But in order to get there, you have to have some idea as to the performance of the raw drivers in the enclosure first. This is just my philosophy, others may have their own opinions. 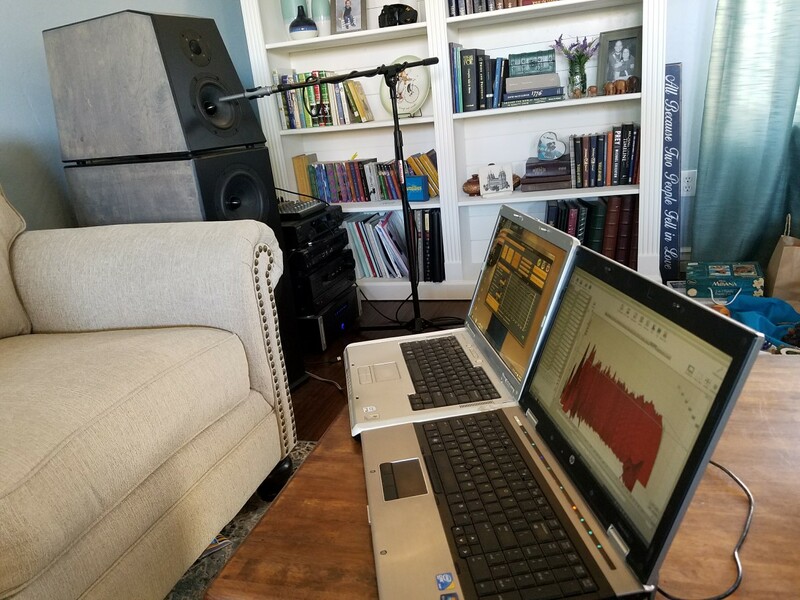 Farfield measurements (or in-room measurements) help understand how to correct for the room modes or other environmental influences that act upon the speakers. Nearfield measurements are used to understand how to correct the response of the drivers themselves and tune crossover points by eliminating (or reducing) the influences of the room. It’s probably more like a two-step approach, measure and tune nearfield, and once you’re satisfied with the response of each driver, checking driver levels, phase, crossover points etc., then you can move on to doing in-room measurements and fine tune the final response in-room to your liking. For now I haven’t done step two, I’ve been listening to the speakers without any additional room correction and they sound great, a little light on the bass probably, but still very neutral. I could go into more detail, and some of this method assumes you have the ability to both tune/EQ individual drives/x-overs and room responses separately (i.e., like with a MiniDSP) but does that answer your question?